*They are among the 5 smartest animals on the planet along with humans, chimps, dolphins and elephants. our pets too. They are clean. Ours are litterbox trained, but will also potty outdoors. *Our pigs are not potbellied pigs. In fact, our bloodlines include less than 4% miniature pot bellies. We get our micro size and unique colors primarily from Juliana pigs in addition to several other miniature breeds. *Pigs do not shed. What I mean by that is that pigs do not shed like dogs or cats do. They do shed once a year and when I say shed, I mean they all of a sudden "blow" their whole coat and get a new one, usually between June-August, some more prevalently than others! Pigs do not get fleas. *Pigs have three sets of teeth. Each time a new set of teeth erupt, the previous set of temporary (baby) teeth fall out. The last of the permanent adult teeth erupt when the pig is about 18 to 22 months old. *Pigs do not have fur (they have hair; therefore, people are not allergic to them or their saliva. 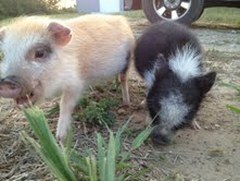 For people who could never before have a pet due to allergies, these piggies may just be the solution. *Our pigs are small due to genetics not underfeeding. Their bodies are denser than the average, thus, their ideal weight is deceiving. *Newborn pigs are born similar size no matter what the breed. Most have reached their adult weight and height by 18 months, muscle and fat accumulate. At least 75% of growth occurs in the first year. *Our breeding stock are not at all related, to ensure no line or inbreeding. 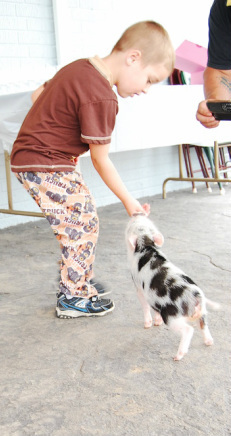 Our micro mini pig parents have been carefully selected to ensure we produce superior mini micro piglets. They love going in the car! Pigs love their bellies rubbed! Pigs make remarkable pets for many reasons! They are extremely intelligent and super affectionate. They are very hardy animals and surprisingly clean! They are very active and are very compatible with children as well as other pets. With the proper time put forth and the adequate love given, your micro mini pig will become an amazing pet with endless possibilities! They live for 15 years on average. We take extreme pride in having the utmost quality micro mini pigs toward ensuring we will be breeding small, healthy, high quality piglets. Our girls are fully mature and our pigs are given the best diet (Fleetwood Farm Micro Mini Pig NutriVittles - available for sale on our site in the products page), a nutritionally balanced mixture of grains, vitamins and minerals along with a "salad" containing fresh veges and fruits daily). Once the piglets are born, they will be left with mom for the best diet until they are weaned. By weaning time at around 3 weeks, they will think of people as additional parents. The babies will be handled and socialized from birth. The piglets will be ready for their new homes at about 4-5 weeks, but only if they are eating and drinking well and they are healthy. We want all of our piglets and their families to do well together. All babies go home with a new piglet info sheet that will help with their care and give you some information and tips on what you might expect in the future. We are also here to answer questions or concerns as your piglet grows. We welcome all to visit our farm and meet our pig parents before or when you select your piglet. 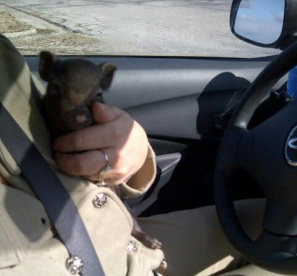 Again, we stress that not all pigs are created equal! Don’t be fooled. There are a lot of people misrepresenting the parent's size, breeding of immature pigs and the basic conditions that the animals are kept in. 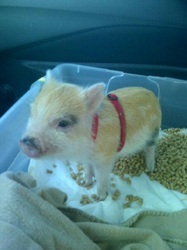 Most customers want a forever pig, not just a cute baby now that will weigh 100+ lbs later! We stand behind the size and quality of piglets that we offer and we are not afraid to prove it. · We guarantee all of our piglets to be healthy upon delivery. Our piglets do not have mites. · Our pigs are indoor/house pigs. The babies are handled and very socialized, however, expect them to be scared and unsure of you at first until you form the forever bond of trust piglets must form with each and every person. 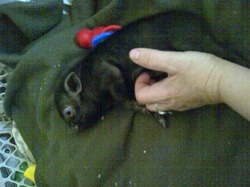 · The expected adult size of a piglet is in the range of the parent’s size. · You pick a name and we will start teaching it to them. · We will keep you posted with updates and pigtures weekly as they grow. 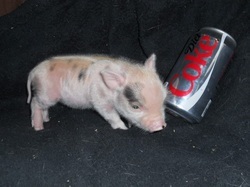 · We will not sell a piglet as a bottle baby. We only want the best for our pigs and they do best with their moms. 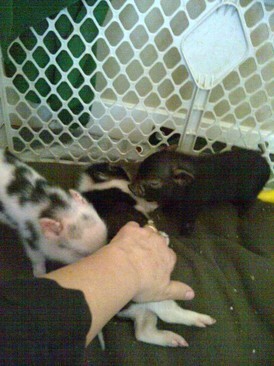 · All male piglets will be neutered unless other arrangements have been made (included in the price). We recommend getting the females spayed at 2-4 months of age. We HIGHLY encourage spaying and neutering. An intact pig will NOT make a good pet. Their hormones will rule their behavior. (All piglets are sold without breeding rights. Breeding rights are available for purchase to qualified buyers.) IMPORTANT NOTE ABOUT ANESTHESIA: NEVER allow your vet to use Ketamine or Halothane to sedate your pig. The only safe anesthesia to use on a mini pig is ISO (Isoflourine gas). Remember this if your mini pig ever needs surgery for any reason. · Piglets go home with an information sheet and a baggie of food. 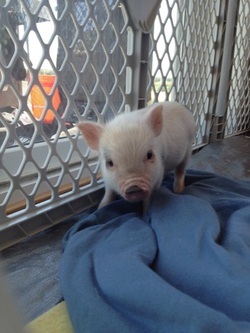 You can purchase feed or litter when you pick up your piglet if you like. 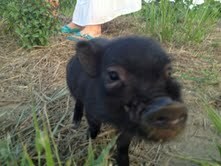 Fleetwood Farm Micro Mini Pig NutriVittles can be purchased at any time for your pig. We have shipping. · We are very easy to work with! 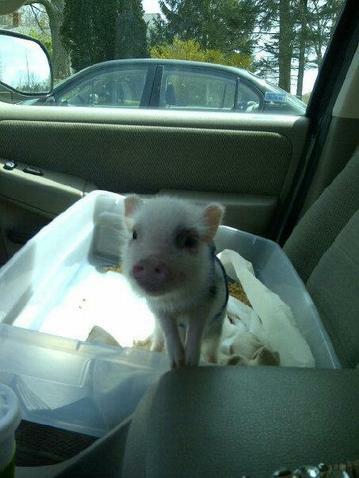 Bringing your new baby mini pig home for the first time is an exciting adventure full of fun! Your oinker might be nervous and scared at first, but this is natural for any animal. Try bonding with your pig by sitting in the pen and hand-feeding them treats. Before you know it, your new companion will follow you everywhere! Your new pig is extremely intelligent and can learn to do just about anything a dog can do, but they learn it much quicker. Don't be surprised if your pig observes you opening a cupboard for food and tries it out for themselves. Their intelligence will never cease to amaze you. Never underestimate your pet’s ability and especially when it has anything to do with food. For the first 2 weeks, do not be afraid to overindulge your baby with treats (raisins, grapes, Cheerios, etc.) in order to bond more easily. Your pet will quickly learn to come to you to receive the treats . After you have initially bonded with your pet you can then cut back on the treats. 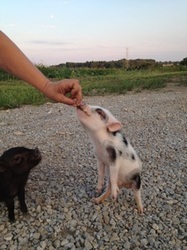 We want to emphasize that pigs can't tell between one treat, or a handful. They will look for more afterword regardless so less is more when treating your piggie (1/2 a Cheerio at a time is plenty). Your pet should be willing to take this from your hand gently without biting. Should you feel that your pet is grabby or aggressive, we suggest you take your finger and tap it on the top of the nose and say, “no bite”, wait a few seconds, then say “gentle”. If they follow the direction, they will then deserve the treat. You will be amazed at how quickly your pet piggy learns what words and phrases mean. 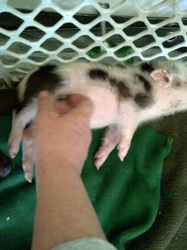 Baby pigs normally will go through an initial period of screaming when picked up; this is a normal response. We work a great deal with handling our piggies so they will be used to being held when you take them home as best as possible, but again, they will need to get familiar and bond with you too. They wont just be hopping into your arms willingly at first, but in no time they will, IF you take the time to bond as specified above as well as in the blog pertaining to bonding with your Micro Mini Pig. Micro pigs easily learn to walk on a leash. They love to go places with you in the car. We take ours to accepting stores all the time. People are amazed when we take them places how micro they are and how well-behaved and sociable they are. It is true that some piggies do like television and have favorite television shows. Some may have little temper tantrums or decide to get mad and ignore you if you shut off their favorite show. It is not uncommon for some pig owners to turn their television or radio on for their pet when they plan to be gone all day. When your piglet is young they will require a Micro Mini Pig food (they are eating Fleetwood Farm Micro Mini Pig NutriVittles when they go home). There are other Mini Pig feeds on the market; a popular brand is Mazuri. The piglets will also be started on half of a Flintstones vitamin with iron. They do not require much food. When you first get your baby pig you only need to give it just under 1/8 of a cup of Mazuri pig chow/mixed with homemade mixture in the morning and 1/8 cup in the afternoon and then another 1/8 cup in the evening. As they get older you can replace the afternoon meal with vegetables and a little bit of fruit, a "salad". We try to start the salad by the time they go home. Never feed your piggy avocado or chocolate since these are toxic to pigs. Pigs also have salt toxicity issues, so never feed your pig salted items such as potato chips or salted popcorn. Air popped corn is fine as an occasional treat. Fruits should always be given in moderation because of the natural sugars. We give ours watermelon with just a bit of fruit left on the rind; this is just a guideline. If your pig is less active and has a slower metabolism you'll need to feed less. If your pig is more active and has a faster metabolism you'll need to feed more. You'll also increase the food intake as they mature. Our pet pig Kwynn gets 1/4 cup of Fleetwood Farm Micro Mini Pig NutriVittles in the morning and 1/4 cup at night with a "salad" in-between. You will adjust that according to how they look. Some days they will look heavy and you will downgrade the amount...i.e. if heavy, give just a flat 1/4 cup. If thinner-looking, give a heaping 1/4 cup. If maintained and monitored properly, it is very easy to keep your pet pig fit. Pigs like a set feeding schedule. We feed ours around 7:00 A.M and 12 p.m. and 7:00 P.M every day. You should gradually change that to meet your schedule. DO NOT EVER FEED chocolate, cabbage, onions,garlic, avacados, salty foods, spinach, iceberg lettuce, gum, alcohol (beware pigs love beer), table scraps, dog or cat food. WARNING !!! If your pig doesn’t have sufficient drinking water it will get salt-poisoning, it is incurable. Symptoms include: walking in small circles, incoherent, won’t eat or drink. Pigs love taking naps! They prefer soft blankets and warm, spacious beds. If are not around to supervise your new baby you should have a pen for them. In your pen you should have their bed, blanket, food dish, water dish, toys and the litter box. Since pigs cannot sweat, they require water at all times so avoid getting a dish they can easily turn over. We use a medium gravity waterer, from the dog supply section. 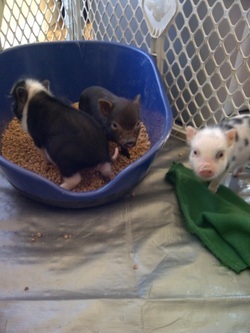 All our pigs here at Fleetwood Farm come litter box trained. They use equine pine pellets in their litter box and can be trained to go outside using a dog door. The litter box should have an opening so that your little piggy can walk in and out with ease. Pigs do not like to climb over the edge of a traditional cat litter box. A good thing to use we have found over time is the Sterilite 31-gallon tub (found at Wal-Mart) with a hole cut out one end, however, leaving the top bar intact to ensure stability and longer-lasting of the litter box. Keep the litter box close when letting your pig out to play. Don't expect a new baby to be able to get to the litter box in time if it is way across the other end of the house. They will in time learn to do that, but just like a puppy, they need to learn their boundaries and it is up to you to watch them and train them and help them succeed. Pigs love going outside when the weather is right! They are very good at staying nearby you when taken outside. Put a harness on them soon after you have the bonding behind you. Let them wear it all day to get used to it. They will buck it at first, but soon will accept it, as they will know that means they get to do something fun. Outside Micro Mini Pigs graze and eat weeds and grass while rooting around investigating things extensively. If you have room in your backyard, it is nice to provide your pet with a small pool to lay in when it is hot outside. 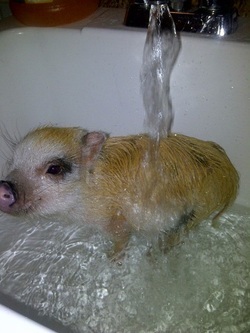 This also serves as a simple way to ensure your piggie does not run out of water or get overheated. Our piggies here love to play in their pools. Just make sure the water level isn't too high. They can swim, but they can also drown! On a warm day, if you do not have room for a kiddie pool, we suggest you provide your mini pig a water dish that is heavy enough that your pet cannot tip it over. ALSO, VERY IMPORTANT...pigs do get sunburned! We like to use Skin So Soft by Avon, as it serves 3 purposes, moisturizer, bug protection as well as sunscreen. Every so often your pig will require a bath! You really should only bathe him/her when he/she is dirty or smelly! Their skin dries out easily. They do not really care for baths, but if you float some Cheerios in their bath, it helps deter their dislike of the bathtime. You will want to use baby soaps and shampoo that will not burn their skin or eyes. I take Kwynn in the shower with me. I place a towel on the floor so she doesn't slip around. It works great. After bathing your piggie, he or she may develop dry skin. We use Skin So Soft mixed 50/50 in a spray bottle to moisturize their skin. Make sure not to miss their ears; Q-Tips or cotton balls are efficient for this! Even though you want to keep your pig clean, it is important to let your pig be a pig and roll around in some dirt once in a while! Make sure to use sunscreen outside. Piggies do sunburn! EVERYONE NEEDS AN OINKER IN THEIR LIFE! If you have any questions, please feel free to send me an e-mail.